With only just over three months left before the PyeongChang Winter Olympics start on Feb. 9, the Olympic Flame is to start traveling throughout Korea, and Jeju will be its second stop! The flame was lit in Greece on Oct. 24 and it will arrive in Incheon on Nov. 1. After this, it will make the journey down to Jeju where it will stay on Nov. 2 and 3. 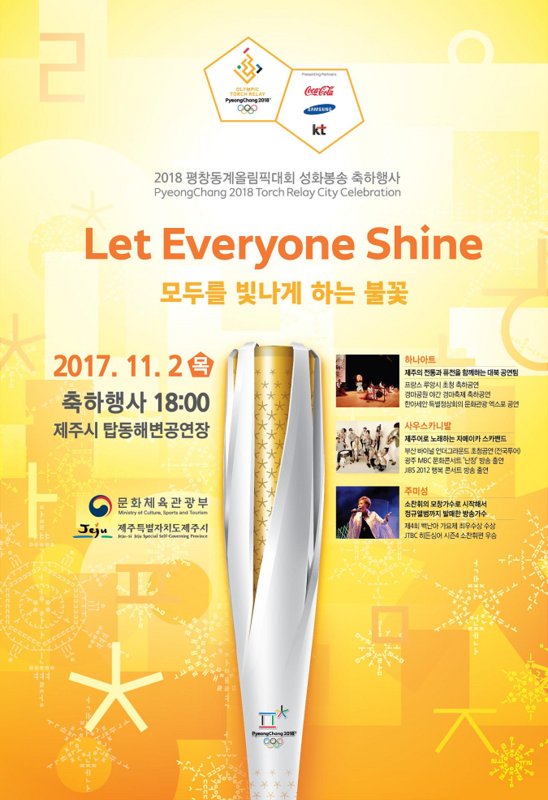 On Nov. 2, the flame will travel from Jeju International Airport to Tapdong and the welcoming ceremony will be at Tapdong Seaside Amphitheater on Nov. 2. It will start at 6 p.m. and will include performances by Hana Art, Jeju based ska band South Carnival, and singer Ju Mi-sung. The theme video for the winter Olympics will also be broadcast. On Nov.3, the torch will travel across Seogwipo. It will begin its journey at the Shilla Hotel in Jungmun Tourist complex at 9:28 a.m. before traveling across the island to Seongsan Ilchulbong. In total, on the first day in Jeju-si it will travel 21.4km across five locations and be carried by 85 torchbearers, and on the second day it will travel 76.9km by 82 people. After its stint on Jeju, it will fly out to Ulsan to continue on its journey. The torch will go on a 100-day journey around Korea. It will be carried by 7,500 torchbearers and will travel a total of 2018 km.